The revolutionary TH208 printer comes with AEP technology that allows customisation of virtually every print mode without the need to modify the printer's firmware. 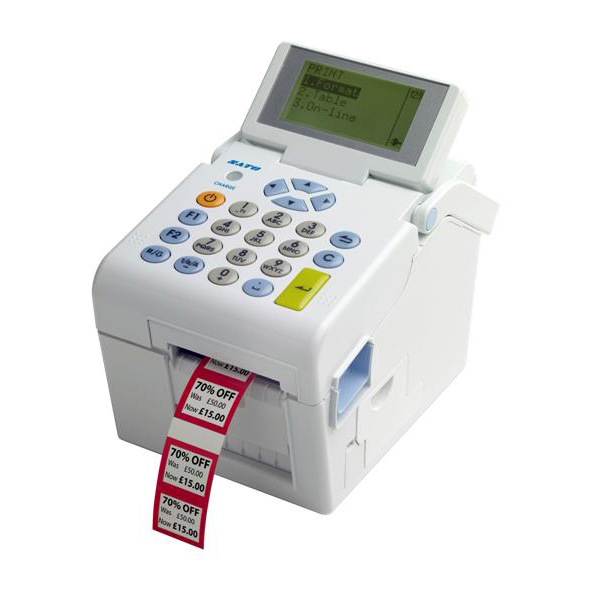 The TH208 printer from SATO is ideal for the hospitality industry, retail and healthcare. The TH208 can be used for inventory management, price marking tags and labels, food labeling, labeling of ingredients, labeling of small items, calculating sales tax, sequential numbering and identification of goods. The TH208 printer is compact and light and can function as a standalone printer with an integrated battery and control panel. The anti-microbial housing is suitable for environments where cleanliness and the prevention of contamination are essential, for example, in the preparation of food or in the health sector. With no PC, ink or ribbon required, the SATO TH2 can print almost any label or tag up to 56mm in width. Designed to be easily programmable for any application, the TH2 is simple to operate as a complete printing solution in conjunction with your own software application. SATO TH2 Series Stand Alone Portable 2.0" wide Printer - USB (Requires Solution Application software). SATO TH2 Series Stand Alone Portable 2.0" Wide Printer - USB & LAN (Requires Solution Application software).